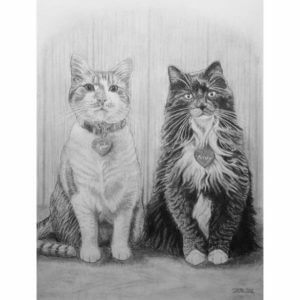 I’m Tim McIntire, an artist from Southwest Missouri specializing in pet portraits. My genre is ultra realism, rather than impressionism or pop art. I work in pencil, colored pencil, and pastel. I can do a portrait of your pet in any size you want, from 24″ x 36″ down to a miniature that will fit in the palm of your hand. I use archival media to create high quality pet portraits that should last for generations. 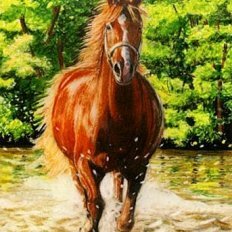 My pricing is competitive with other pet portrait artists, and shipping is always free to the USA. Turnaround time varies with my workload, but given good photos I can usually finish a pet portrait within 2-3 weeks of order placement. If you are interested in creating a lasting memory of your pet, please send me a no-obligation inquiry and I will get right back to you. 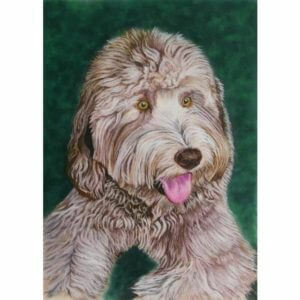 A custom pet portrait is a multi-hour undertaking involving art skills that require years to develop. 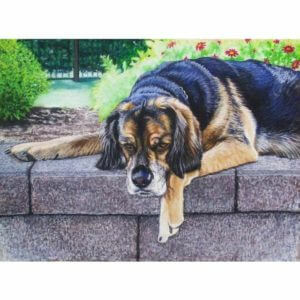 For this reason, fine art pet portraits can easily run $1000 or more. Knowing that not everybody who wants a pet portrait has an unlimited budget, I have set my pricing very competitively for all media and sizes. 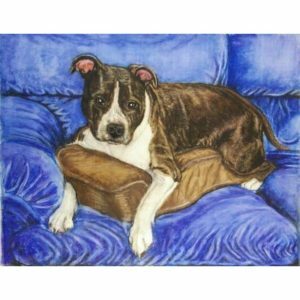 I have also developed ultra-low-cost options in pencil and colored pencil, miniature pet portraits about the size of a wallet photo print. Using special techniques and surfaces, it is possible to fit a remarkable level of detail into this small space. The result is an original artwork that will look great framed on your wall or coffee table, but often cost less than a session with a photography studio. 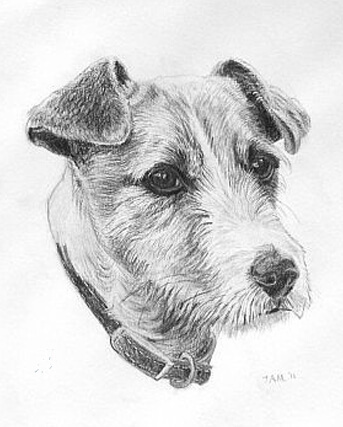 No matter how adept the artist may be, a pet portrait is ultimately no better than the reference photos provided. They should be clear and well-lit; outdoor shooting works great. At least one close-up of the pet's face should be included, and a photo of the desired body position if we are doing a full body portrait. In the case that the pet is deceased and no really good photos are available, I can still work with you to reconstruct the pet's image, but there will be a moderate extra charge. 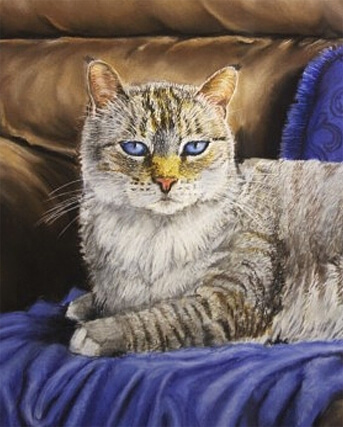 Many pet portrait artists specialize in just one medium. This is a fine approach, but I prefer to offer several choices in order to accommodate the widest possible range of preferences. The basic choice, pencil, is the most affordable option and can produce very sharp detail. 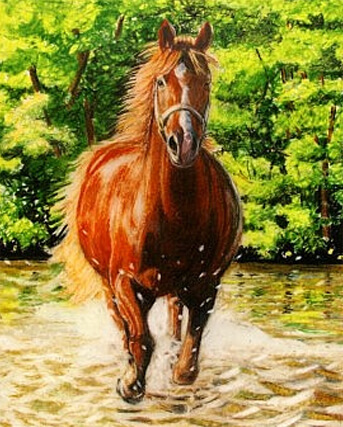 Colored pencil on smooth drafting film provides the best level of detail in color, but takes longer than other media and isn't as well suited to larger pieces. All around, the most popular choice for color is pastel, with its warm, smooth tones and relatively quick finishing time. 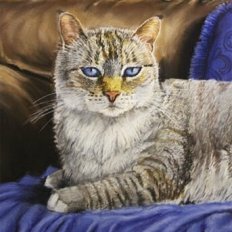 For larger color pet portraits, pastel is generally the best option, especially because of the relatively short completion time. If you don't have a particular media preference, don't worry. After looking at your reference photos and discussing your needs, I can make recommendations to help you choose the right media for a lasting pet portrait memory. 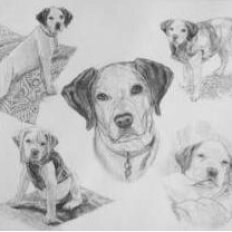 Whether it's Christmas, a birthday, or a time when you just feel like doing something special, an artist pet portrait is a near-surefire hit with any pet owner. If you're not confident choosing the size and media, or if you don't have access to suitable pet photos, you can order a gift certificate instead. Just send me an inquiry and I will get you fixed up with a nice-looking pet portrait gift certificate to present to your loved one. I can do gift certificates by dollar value or by size and medium, depending on what you want. Everybody has a digital camera these days, but not even a professional photographer can capture your pet's personality in the same way that a pet portrait artist can. In fine art, we reduce the elements of the picture that distract from the point, and emphasize the elements that call to mind your pet's distinctive personality. Particularly, much of a pet's identity is found in the eyes. Those eyes can reflect wisdom, mischief, lovable endearment, or a thousand other things. Whatever they show, it can be recaptured by a sensitive pet portrait artist and preserved for a lifetime. 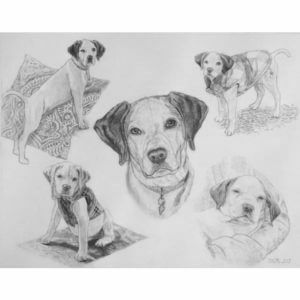 Black and white pet portraits are particularly good for bringing out striking detail without the distraction of brilliant color. To initiate the process, send me a no-obligation inquiry with information about the pets and any ideas you may have for the portrait. If you include a phone number with your inquiry, I will be happy to call you and discuss the project. Once I see your photos and we agree on size and media, I can get started. When the pet portrait is ready, I will send a digital image for your review and feedback. Once this revision process is completed and the commission fee is paid, I will ship your portrait free via the US Postal Service.